Get the completely revised edition to mastering the visual language of architecture.In his distinctive graphic style, world-renowned author and architecture educator Francis D.K. Ching takes us on another exciting journey through the process of creation. In Design Drawing, Second Edition, he unmasks the basic cognitive processes that drive visual perception and expression, incorporating observation, memory, and rendering into a creative whole. This edition unites imaginative vision with fundamental architectural principles to cover the traditional basics of drawing, including line, shape, tone, and space. 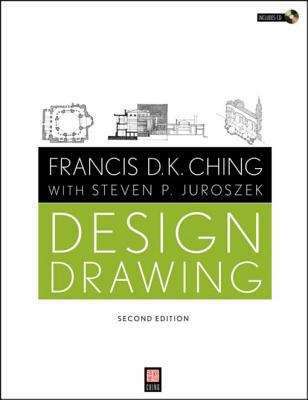 Guiding the reader step-by-step through the entire drawing process, Design Drawing also examines different types of drawing techniques such as multiview, paraline, and perspective drawings -- and how they can be applied to achieve stunning results. In addition, this edition:Goes beyond basic drawing books--Ching not only covers the principles, media, and techniques of drawing, but also places these within the context of what and why designers draw.Features more than 1,500 hand-rendered drawings--beautiful illustrations that reinforce the concepts and lessons of each chapter.Includes a supplemental CD-ROM--viewers will gain a greater appreciation of the techniques presented in this book through the power of animation, video, and 3D models. Twelve new modules are included, as is a video of the author demonstrating freehand techniques in a step-by-step manner.For professional architects, designers, fine artists, illustrators, teachers and students alike, this all-in-one package is both an effective tool and an outstanding value, demonstrating concepts and techniques in a visually stimulating format that transends comparable works in the field.